Cottingham is a part of the Deaconess Communities, a non-profit organization, and we’re proud to have all the benefits that go along with it. As a non-profit senior community, we are focused on you and not making huge profits. We’re comfortable placing all our effort on our residents and hiring a highly qualified staff. Cottingham Retirement Community offers everything under one roof for independent lifestyles, assisted living, rehabilitation, long term care, and memory care. You’ll have peace of mind knowing that you will not have to move when your needs change. Cottingham Retirement Community was established in 1984. We are non-denominational and welcome those who are 70 years and older. There is no endowment fee, only a one-time community fee. You’ll have everything you could dream of needing and people that care about you. Steady U Ohio is a statewide collaborative falls prevention initiative, supported by Ohio government and state businesses (including Cottingham), to ensure every Ohioan knows how they can prevent falls, one step at a time. Cottingham Retirement Community is conveniently located within minutes of several major freeways- I-275, I-75, and I-71. We are located in a thriving metropolitan area that offers many resources close by such as: shopping malls, Horseshoe Casino, Taft Theater, beautiful parks, activities and dining on the Ohio Riverfront, The Great American Ballpark-home to the Cincinnati Reds, and more. You might be tempted to sneak out at night for a few laughs! Cottingham rates are very affordable; you might say we are the best kept secret in town! There is a one-time minor community fee then your monthly rent. Expenses at a retirement community encompass everything you need and can possibly be less than your current home expenses once you do the math. Utilities, phone, cable TV, weekly housekeeping, and weekly linen changes are included. You won’t find those perks at home! If you require financial assistance, come and talk to us. We can offer several resources that may be able to help. Please contact our retirement counselor for more information, email, or call us. Our philosophy is to provide the highest level of care and attention and we know how you love to be pampered. We offer a high staff ratio of one to five in Elizabeth Court Memory Care, meaning one qualified staff member for every five patients, which ensures a high quality of care. Ivy Court Long Term Care has approximately one to eight staff ratio. We take pride in our Veterans and sharing their stories. “The Avenue” is a long hallway filled with photos and memorabilia we have dedicated to remembering them. We are happy to share this video featuring Sgt. Raymond Arnett, one of our current residents. Another deficiency free health survey was achieved for 2018! The Ohio Assisted Living Association representing the largest number of Residential Care Facilities in the State recognized Cottingham Retirement Community for our deficiency free survey in 2018. Click here for the 2018 certificate. 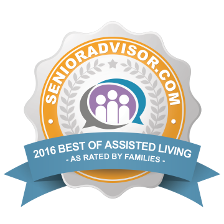 The annual SeniorAdvisor.com Best of 2018 Awards recognize outstanding senior living and home care providers who have received consistently high ratings from residents and their families. Winners of the SeniorAdvisor.com Best of Awards are located all over the country and represent the top tier of in-home care, assisted living, and other senior living providers in the country. The award places winners in the top one percent of senior care providers nationwide! For more information visit SeniorAdvisor.com, click here. Kristen Watson is thrilled to be a part of the Cottingham community. She previously worked as a Life Enrichment Director and Assistant Executive Director at an assisted living community. Kristen loves interacting with seniors and is passionate about helping residents and their families. If you are interested in calling Cottingham “home” or would like information on retirement living, please contact Kristen – she would love to speak to you! Mark Harris – Director of Environmental Serv. Pam Kankowski – Mkting & Operations Coord. Jacqueline Calhoun – Elizabeth Court Coord. Darla O’Calaghan – Assistant D.O.N. Shelley grew up in Sharonville and attended Princeton High School. She went to Eastern Kentucky University and graduated with a Bachelor’s degree in Sociology. She received her Administrator’s license in 1992. Shelley has worked as Administrator of Mason Health Care Center in Mason (our sister community) and the Administrator of Ivy Court at Cottingham. Shelley welcomes, enjoys, and learns from the opportunity to serve our residents. She understands the needs of the residents and strives to make Cottingham feel like home. Shelley lives in Mason and has a cat named Daisy. She loves to read, cook and bake. Upscale craft shows is a favorite past time! Shelley recently started walking in 5k’s and has completed two with another one coming up! Thank you for your interest in becoming a part of the Cottingham team. WE REQUIRE AN APPLICATION BE COMPLETED FIRST TO APPLY ONLINE FOR ANY POSITION. To submit an application: click application next to any job posted, save the application to your computer and fill out. Once completed, then upload and submit. A resume is optional. Simply click the browse button, locate your document on your computer and click to insert. Then click submit. If you do not have a resume or application to submit online, you may fax your application to (513-563-3717), mail or bring in your application in person. Please do not submit a resume unless you have completed the application. Responsible for direct care of residents – requires documentation of care provided throughout a 24 hour period. Life Insurance and much more! Day and evening shifts, hours vary. If you are available at least one day a week and every other weekend, we have an opportunity for you. For immediate application review, print the application, complete, and email directly to Human Resources: mwalden@cottinghamrc.org. Additional hours are available on the weekends. A resume is optional. Note: Please DO NOT submit unless you have comleted the application first and attached. Continue to submit a resume only if you have attached the application.